100,000 | RV There Yet? But here’s the Really Big News. Today, just before we crossed the Texas state line from Oklahoma, this happened. Thank you, Lord, for this trusty RV that has reached this milestone! 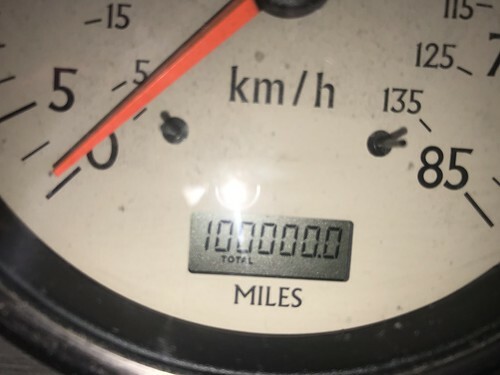 Happy 100,000 miles together SOWERing. Such a beautiful way to serve our Lord! May you have a couple more 100 grands. YAHOOOOOOO!! I know the 100 K is a huge milestone, but really the biggest surprise to me was navigating FT. WORTH traffic in the afternoon. My precious Momma from Alabama has lived there and now 60 miles south, since the 80’s and it is a mess! You folks both deserve 2 of those candy bars!! Let us know if you ever need ANYTHING and so my big question is: what are the 2 states you have yet to drive thru?? Stef and Walt, Living the MTN dream in NC! Thanks! The two missing states are North Dakota and Hawaii! Still waiting on the bridge! Congratulations 🎉 on 100,000 miles and all the lives you have witnessed to through the SOWER ministry. May you and your family have a blessed Thanksgiving.